When we attended a few public meetings in the Uists in the winter of 2009, the weather outside was pretty stormy. On occasion the atmosphere inside was pretty stormy too. We were left in no doubt that the crofting population valued the machair and was deeply concerned about its future. It was also made clear to us that there were significant challenges that would need to be addressed if crofting was to survive and flourish on the machair. We listened to these concerns and whilst there are inevitable constraints with any funding programme, I believe we made significant progress in either addressing them, or helping to show how they could be addressed in the future. We showed that a well-organised and motivated team could minimise crop damage from geese. We worked in partnership with townships, which reaffirmed the value of seaweed as a fertiliser. We helped get some old binders going again and discovered the frailties of the modern equivalent. Seed drying and shallow ploughing proved popular, as did rotovating and our SRDP workshops. Local schoolchildren were enthusiastic about our machair art courses and produced fantastic art work which hung in a gallery and scarecrows which stood out in the fields. 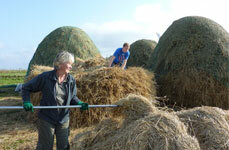 We had great help and support from our partners and most of all from the crofting community of Uist. I think it went better than we could have hoped, or imagined, and great credit for that must go to the project staff. My only regret is that it is all over so soon. We achieved a lot, but if there is a lesson, it is that managing a resource as valuable and fragile as the machair, involves a lot of people, needs a lot of support and must be subject to a long term approach. The Conserving Machair Life+ project ran from January 2010 to June 2014. Machair Life+ Worksheets - What is the Machair? Machair LIFE+ Conserving Scottish Machair - A' Dìon Machraichean na H-Alba from UistFilm. 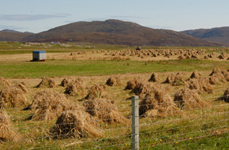 Machair Life was a four-year project which ran from January 2010 to June 2014, and aimed to demonstrate that traditional crofting practices have a sustainable future. We hope that the project will have helped to secure the immensely important conservation value of the unique machair habitat, 70% of which was covered by the project. 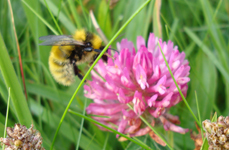 Machair Life was supported by the European Union LIFE+ scheme, and managed by The Royal Society for the Protection of Birds (RSPB) in partnership with Scottish Natural Heritage (SNH), Comhairle nan Eilean Siar (CnES) and the Scottish Crofting Federation (SFC). Machair habitat is extremely rare, and changes in local agricultural practices have occurred that are now threatening the condition of the habitat and the conservation status of key flora and fauna populations. Through working closely with crofting communities, agencies and partners within the designated Natura 2000 sites, the project team hope to secure and improve the conservation status of 70% of the world’s machair. 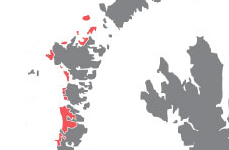 The project mostly covers Uist, as this is where the majority of machair occurs. However, areas of Barra, Coll and Tiree, Oronsay and south Colonsay, Islay and Lewis are also included. See our map and more details of these areas. Machair is rare, bio-diverse coastal grassland, unique to the north-western fringe of Europe. For generations, man has worked and moulded machair in a low intensity crofting system that has created a mosaic of open habitats. The Machair LIFE+ conference sees the launch of the latest in our series of advisory leaflets. The new leaflets cover the use of seaweed as an organic fertiliser and the indigenous varieties of cereals grown on the Uists. A further advisory leaflet on the topic of crop protection will be published later this year. We are offering payment incentive of £400 per hectare to crofters who are able to put aside corn crop for seed by binder or combine for 2013. This option is open to applicants within the Uist and Barra Natura 2000 network (SAC, SPA). If you are interested in this option please contact the office for more information. Come and meet us at the Uist Agricultural Shows this summer. We will be at South Uist and North Uist shows on 23rd July and 10th August where you will have the opportunity to meet with the team and look over our modern reaper binder machine. We look forward to meeting and talking with you about how the project may support crofting on your croft. Goose Damage - Are Geese Damaging Your Crops? If so, get in touch, as the project is deploying goose scarers to enable crop protection. Please contact Uists Goose Scheme Coordinator Rory Macgillvray on 07879 443518 For more information, please visit the How Can We Help page, and click Crop Protection. The project has initiated 30 Management Agreements with crofters across the Uists, which have agreed a series of traditional crofting practices which will benefit the machair, such as the late harvesting of arable crops. Management work has included over thirty hectares of seaweed being spread as organic fertiliser to benefit machair crops, resulting in management uptake. Botanical and invertebrate survey and monitoring work will begin week June 6th. This is the second year of work by our appointed Cambridge–based consultancy Applied Ecology Ltd. We hope this work will reveal important findings. The project is stepping up its engagement with local schools through a series of practical wildlife and crofting sessions on the machair and a planned interpretation of the machair through school arts programme and crofting connections. The Conserving Scottish Machair Life+ Project, Uist Greylag Goose Management Scheme document has been produced. Download a copy of it (if you cannot view PDFs, download a viewer). This explains how the Project will coordinate the 2010 Uist goose management scheme. We will be utilising a mix of coordinated goose management methodologies, including some tried and tested methods, but also some new, which have been proven to work in other schemes. The project will be closely monitoring what works best for the Uists.